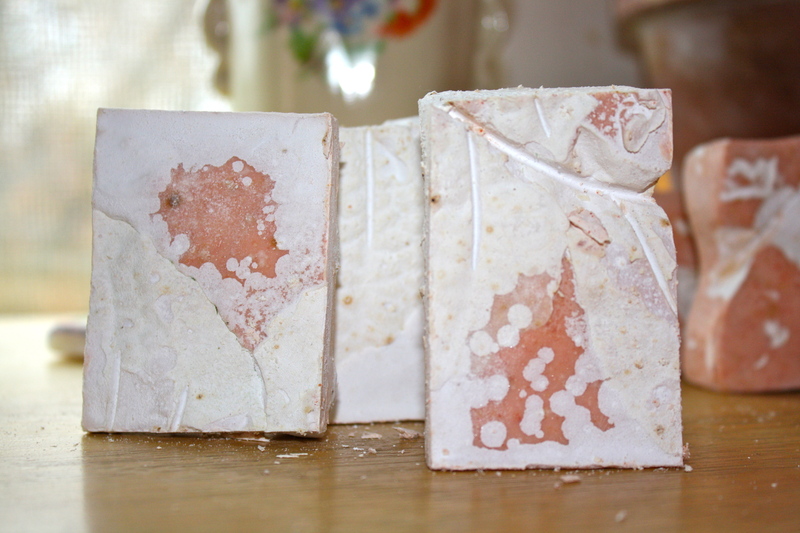 One of the best parts of making soap is the unexpected results! 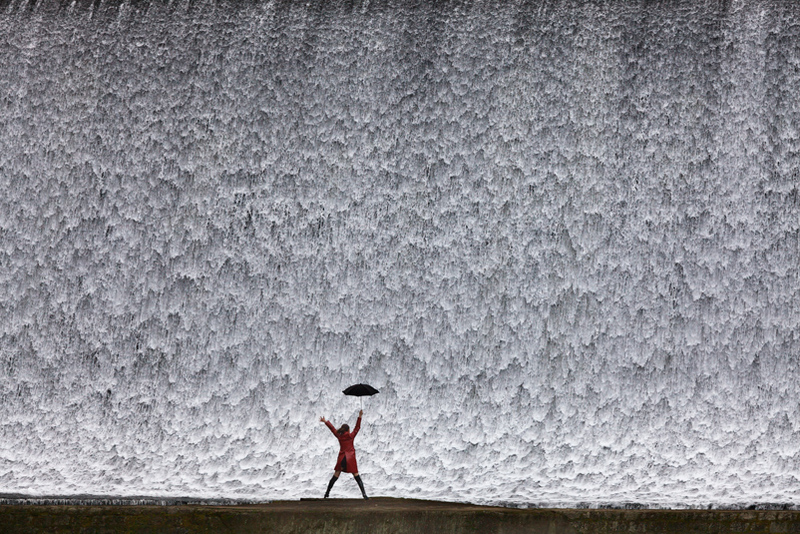 You never know for sure what will happen. So when the batch that was supposed to be a deep brown/orange color with the scent of nutmeg ends up looking pink and covered with a white dust, it’s time to pull out the potato peeler! 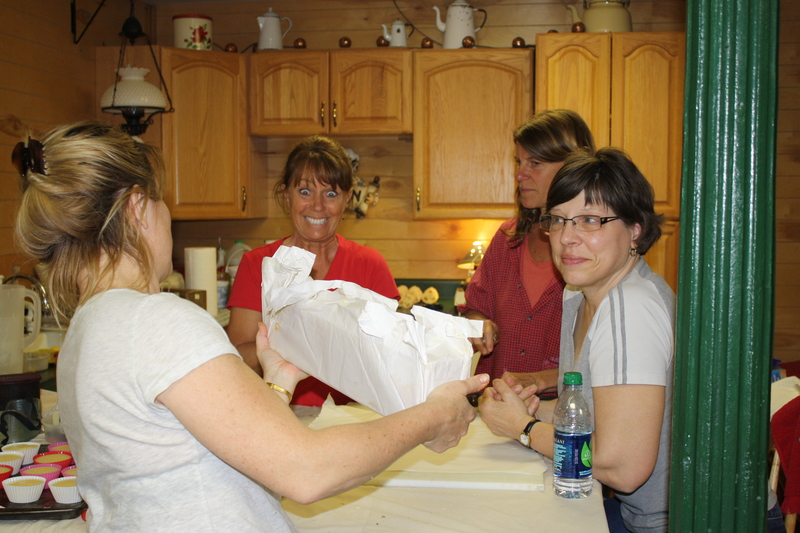 This past weekend I joined my sister and a couple of her friends for a new twist on a very old method of making soap. We have created several batches of soap using the stove top method of melting oils and allowing them to cool while waiting for the lye water to cool also until both the fats and the lye water are 100 degrees and then combining them. This method requires lots and lots of stirring with a wooden spoon and waiting for the mysterious “tracings” to occur. It is an excellent method for the beginner, as you do learn lots of tricks and gain experience from this slower process. 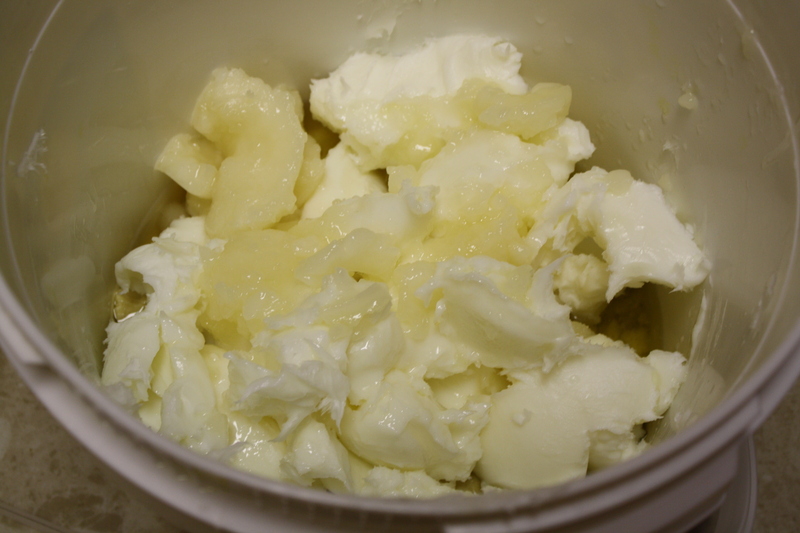 However, we were getting antsy to try some bulk soap and found instructions for cold processing: combine fats and oils together in a big bucket, and add your very hot lye water to melt the fats. Blend with an electric mixer and va voom! Done. 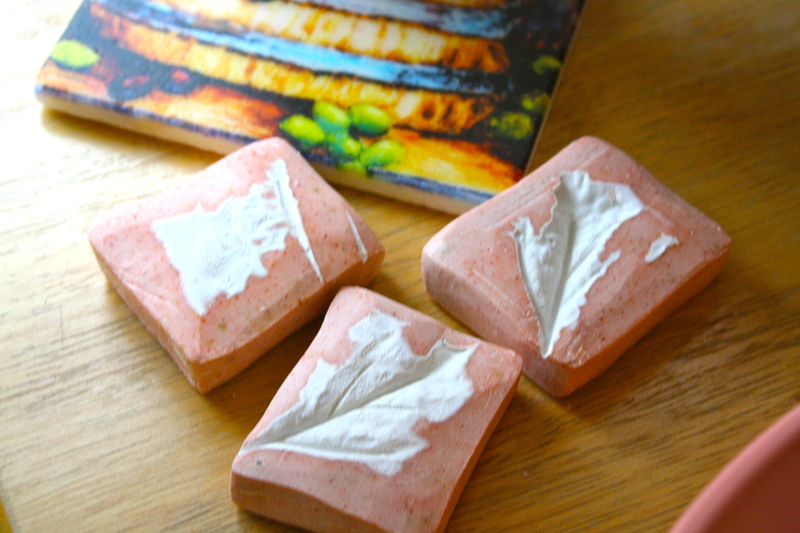 Her friends had never made soap before, so we two were the experienced of the bunch. We found a lye calculator online (see link) and plugged in the ingredients we had: lard, coconut oil, olive oil, castor oil, tea tree oil, cocoa butter, beeswax, and various other things. We played around with recipes, and got to work measuring all the fats and oils. Next up: Mixing the lye and water. This is the scary dangerous part. That’s why I get to do it! It can burn your eyes and nose and of course your skin (anyone seen Fight Club?). Use caution. This lye is labeled as a household drain opener. Don’t go out and buy drain opener for soap making unless it’s 100 percent LYE. Not all drain openers are the same. 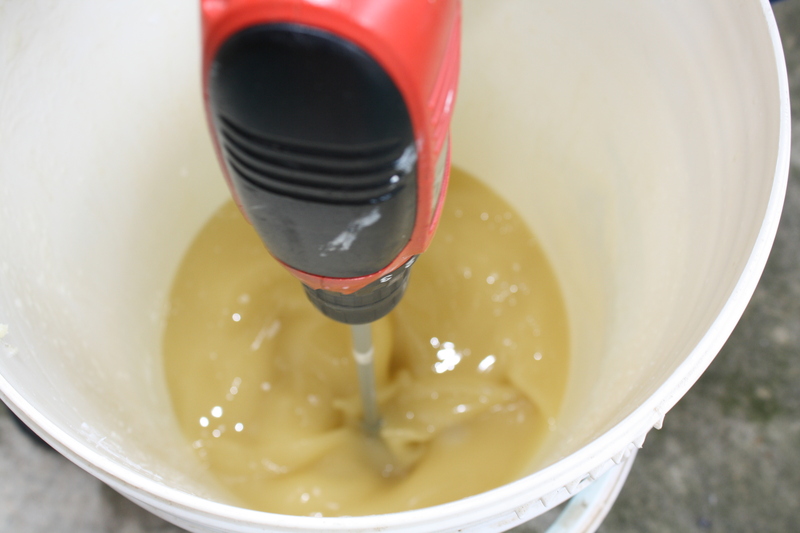 This is the first time we have used a power drill and a mixing attachment to blend the soap. 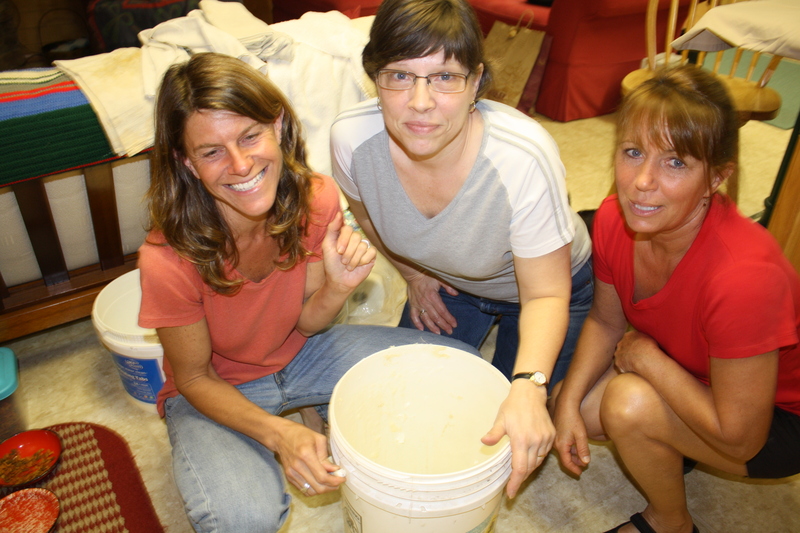 We discovered the deeper five gallon buckets work best. Sometimes tracings were seen very quickly. In one batch we saw them even before all the solids were melted. In another, we blended and blended and wondered if we saw any! Just before pouring into molds, we scented our soaps with essential oils, added herbs, coloring, sand, or whatever else we wanted to try. This particular batch is colored with paprika and scented with myrrh and other oils that gave it a earthy cologne smell. We called it Mansoap. This batch had great tracings. If you look carefully, you can see them on the big block mold. Brother-in-Law was kind enough to make a few wooden molds for us. These make beautiful big bars like you see at craft fairs. This was our first time with the large molds. The anticipation was killing us! 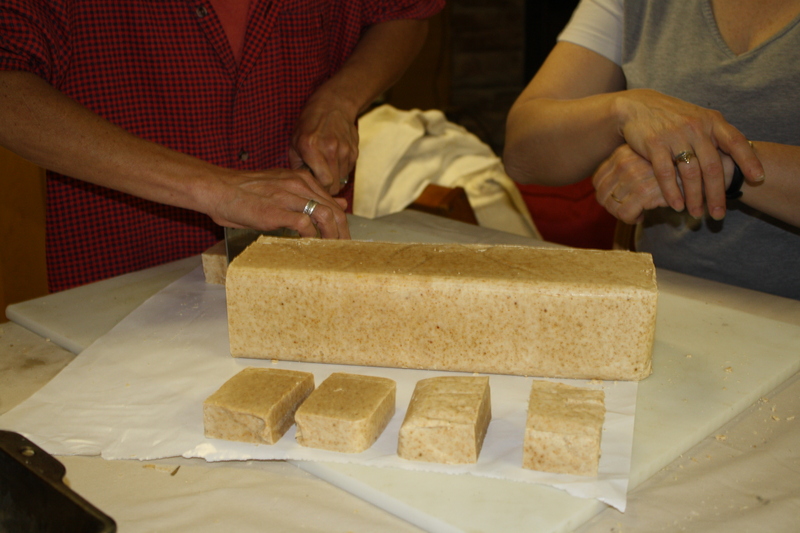 But it only takes 24 hours for the soap to set up enough to cut it into bars for curing. My sister and I did this the night before so our newbys could see what the finished product would be. 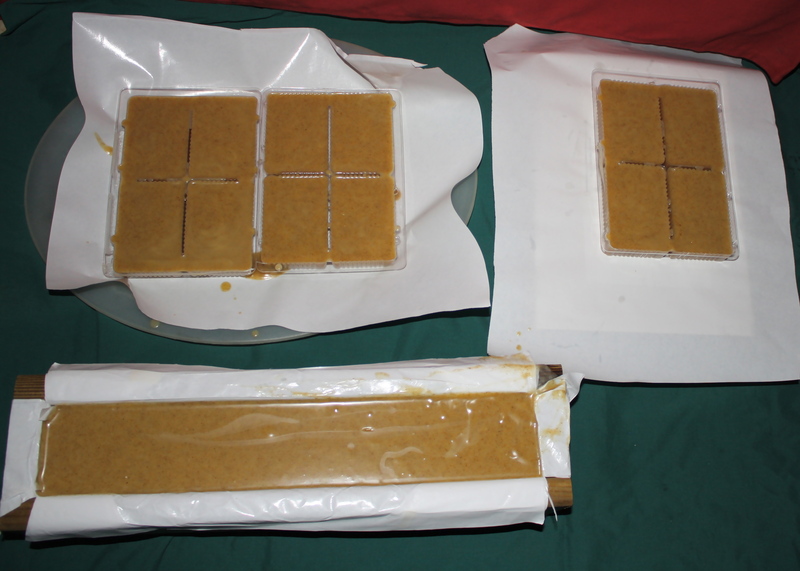 They came the next day, and we worked on several batches and combinations until we had poured about 40 pounds of soap into molds. By the end of it all, we were very excited to see what the block from the previous night looked like. We had a bit of trouble getting our block soap out. But after lots of pulling and fussing, we finally loosened the sides with a screwdriver, and it popped right out. 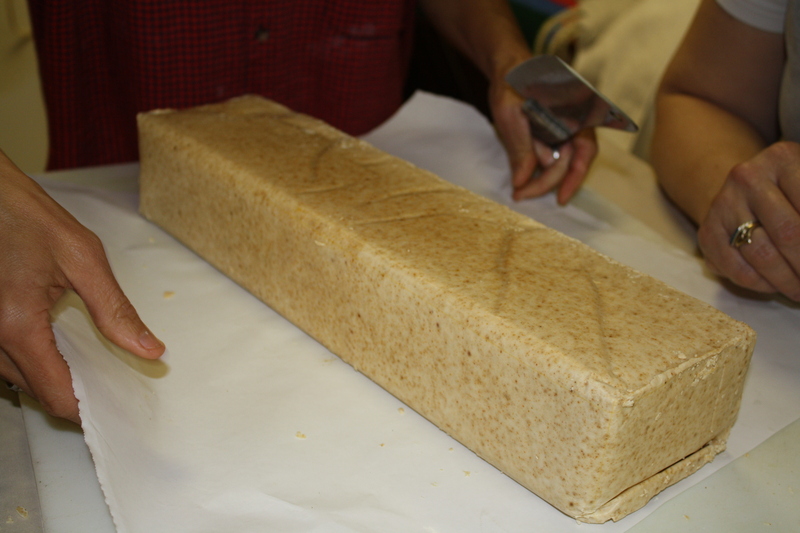 Cutting the soap was like cutting into a gorgeous wedding cake. We were ooing and ahhing and so impressed with the finished product! 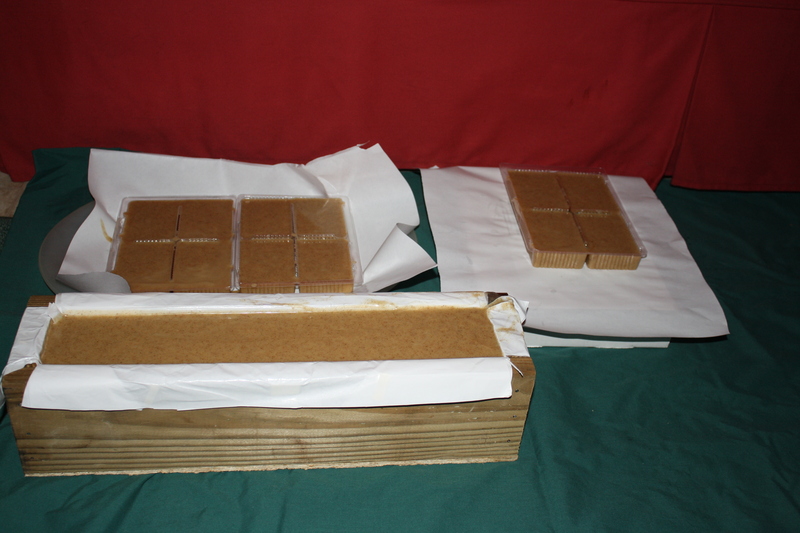 These soaps will sit for 3 weeks or so to harden more and cure. They are ready when you take a bar and wash your hands and feel no bit of stinging. 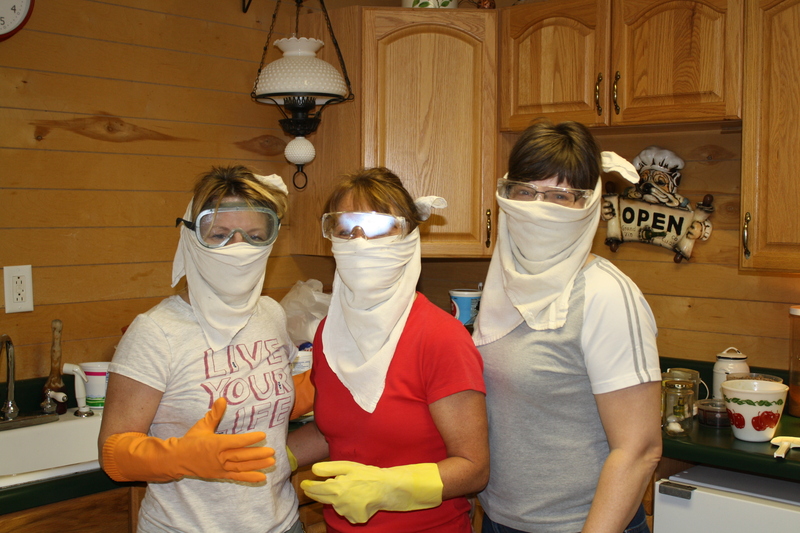 They are still a little caustic for the cutting, so gloves should be worn (even though we didn’t). And here are some highlights from the afternoon. 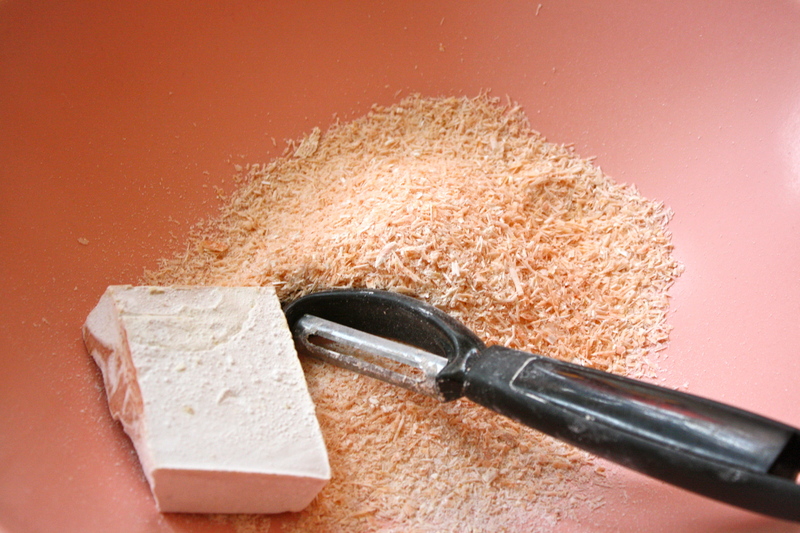 You can whip up your own laundry soap for a fraction of the cost of others. And once again, the sweet satisfaction of making it yourself shines through. 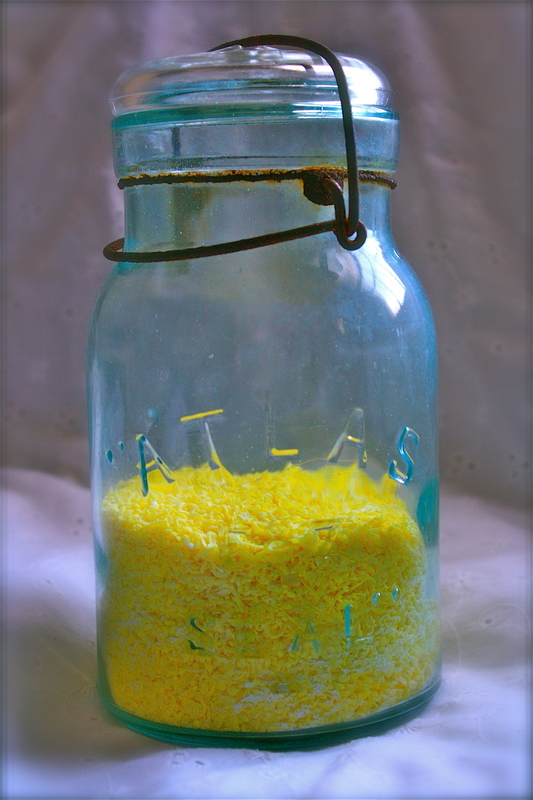 I’m overdue in making lye soaps, but when I do another batch , I will set some aside especially for shredding into laundry soap. 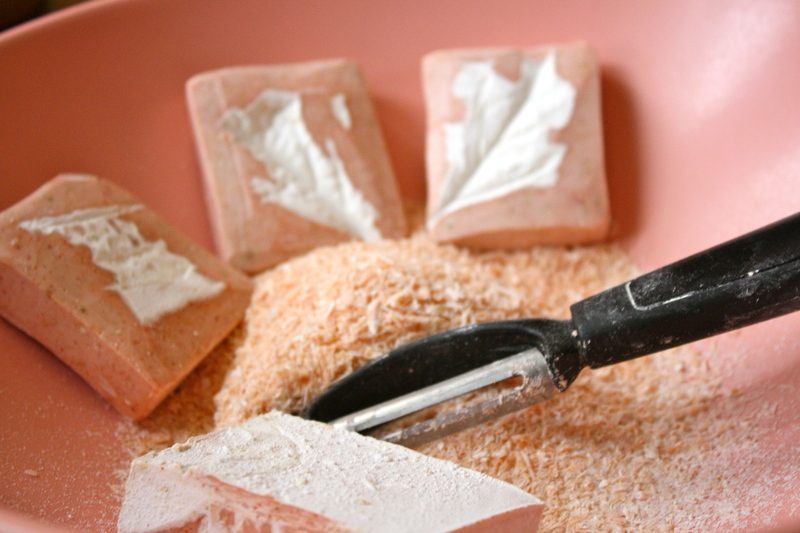 Or better yet, all the scrap soaps normally saved for rebatching can be shredded up for the laundry! 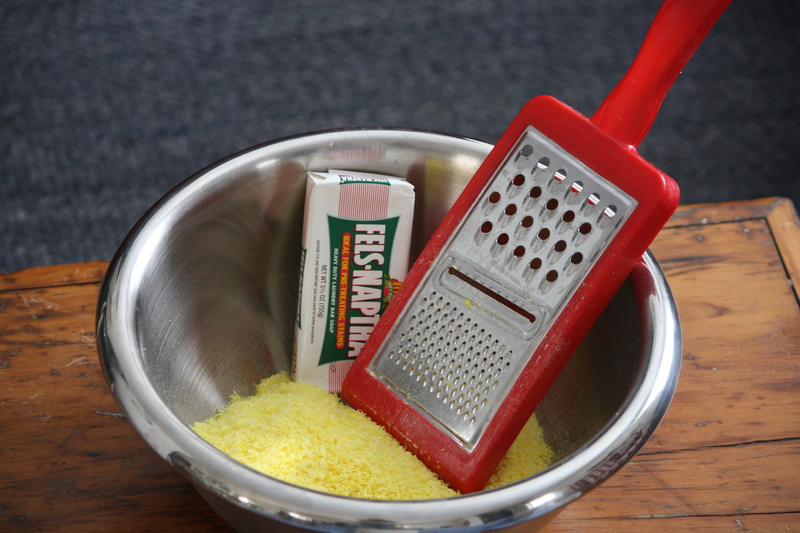 With this mixture, you only need a tablespoon per load! I tend to panic and use two. 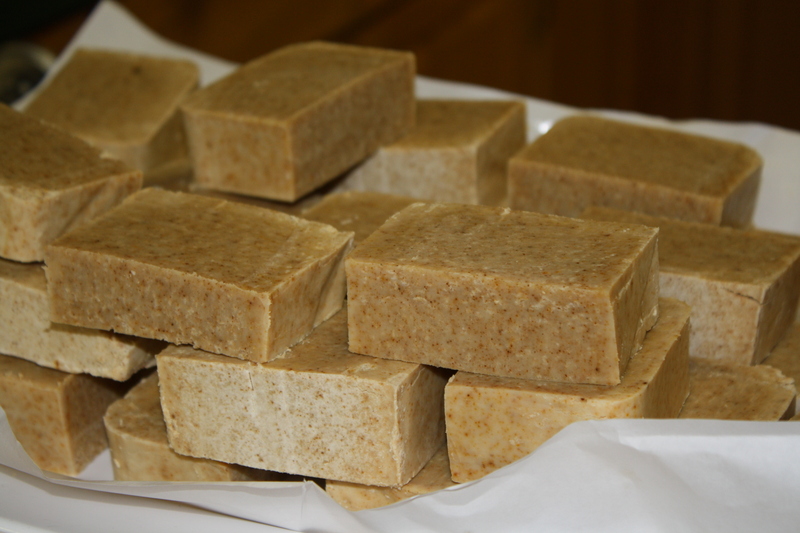 Check out DIY Natural for more information including instructions for liquid soap if you prefer. I just ran out of the last of my Tide. 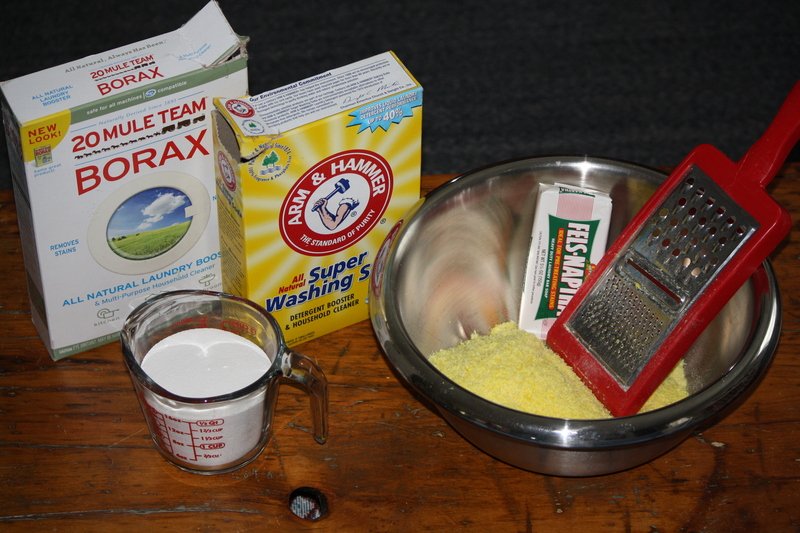 I didn’t make the leap to home made laundry soap without having some Tide on hand. But I ran out of my first batch of homey soap, and then ran out of Tide. I can officially give my report on the quality and I must say, I am impressed! I haven’t noticed a bit of difference using the home made and using my old standby, Tide with Bleach. So now I finished a big double batch of the fun new Fels Naptha stuff. 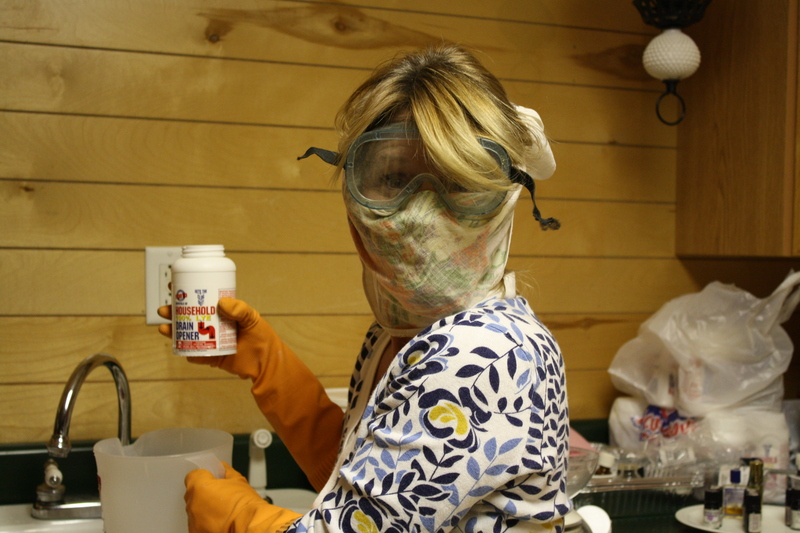 I had intended to shred my own home made soaps, but they are still curing down south! I did a little calculating, and this new soap costs about $15 for 336 loads. For me, it’s not so much about saving a buck. It’s that I like having jars of homemade stuff all around me. I do wish I knew this little trick back when I was doing laundry for SIX! So there you have it; an update on the dirty laundry. I best get to it!